1. Place the rice into a large saucepan. 2. Add 700ml cold water - or half water and half white wine 3. Bring to the boil, add the butter and simmer gently for 6 minutes, stirring occasionally. 4. 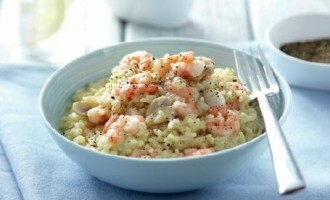 Drain the mushrooms and add to the rice along with the prawns, season well with black pepper. 5. Continue to cook, stirring, for another 6 minutes then serve.